Last year I launched a new series on Crime Watch, "I Can't Wait to Read", which features myself and some great guest bloggers highlighting crime novels we're really looking forward to reading. In 2015, the series is back from hiatus. I'm looking forward to sharing some great new and upcoming books with you - exciting titles from debutant, on-the-rise, and well-established crime writers. Today, I'm stoked to share more about the upcoming novel of a young and talented New Zealand author who has established himself in our part of the world over the past five years, but may now be on the cusp of his big breakthrough globally. Ben Sanders has written an acclaimed trilogy set in Auckland, but last year was picked up for publication by MacMillan in the US, and is writing his first US-set crime novel. The early response has been amazing, with the film rights sold to Warner Bros even before the novel has been published (several film and television companies were keen), and Bradley Cooper tabbed to star. I'm sure we'll all be hearing a lot more about Ben Sanders and AMERICAN BLOOD, the book and the potential film, over the next couple of years, but for now, here's why I can't wait to read this crime novel. After a botched undercover operation, ex-NYPD officer Marshall Grade is living in witness protection in Santa Fe, New Mexico. Marshall’s instructions are to keep a low profile: the mob wants him dead, and a contract killer known as the Dallas Man has been hired to track him down. Racked with guilt over wrongs committed during his undercover work, and seeking atonement, Marshall investigates the disappearance of a local woman named Alyce Ray. Members of a drug ring seem to hold clues to Ray’s whereabouts, but hunting traffickers is no quiet task. Word of Marshall’s efforts spreads, and soon the worst elements of his former life, including the Dallas Man, are coming for him. Written by a rising New Zealand star who has been described as “first rate,” this American debut drops a Jack Reacher-like hero into the landscape of No Country for Old Men. With film rights sold to Warner Bros, and Bradley Cooper attached to play tortured hero Marshall Grade, American Blood is sure to follow in their award-winning, blockbuster success. Ben Sanders is a young engineer from Auckland's North Shore. His first crime novel, THE FALLEN, was published when he was just 20 years old, studying for his engineering degree at university. Now 24, he has published three bestselling Auckland-set crime novels (starring local cop Sean Devereaux and his sometimes-trusty sidekick, ex-cop John Hale), before setting his sights on the US market by being picked up by MacMillan and penning AMERICAN BLOOD. He is a former finalist for the Ngaio Marsh Award, and his terse yet evocative style has been favourably compared to Michael Connelly and Lee Child. "Sanders writes in a punchy, crisp style, employing short sentences and terse but telling descriptions - rather than languid or overwrought prose - to evoke a strong sense of the various Auckland settings, and his characters' thoughts, actions, and motivations. There is a sleekness to his storytelling that would be impressive for any crime writer, let alone one so young." If this was Sanders' fourth Auckland-set Sean Devereaux tale, I'd be looking forward to the read. The fact that he's switched settings and characters to explore the American Southwest, an area of the United States that I'm particularly fond of and have visited several times, only intrigues me further. To be honest, I'd have that mix of hopeful and nervous expectation (will it be a great change, or will he lose something when he's not writing about the city he grew up in and knows so well? ), but I've actually had the very good fortune to read the early chapters of a draft of AMERICAN BLOOD last year. And quite frankly, I was blown away. The chapters I read were Sanders' best writing yet. It's like he has matured and things have just 'clicked', when he was already pretty damned good anyway. Reading those first chapters was like watching a young sports star suddenly come of age on the field, in a big game, before your very eyes. So I am super-excited for the release of AMERICAN BLOOD - and hopefully the film too! What do you think of the film potential of AMERICAN BLOOD? 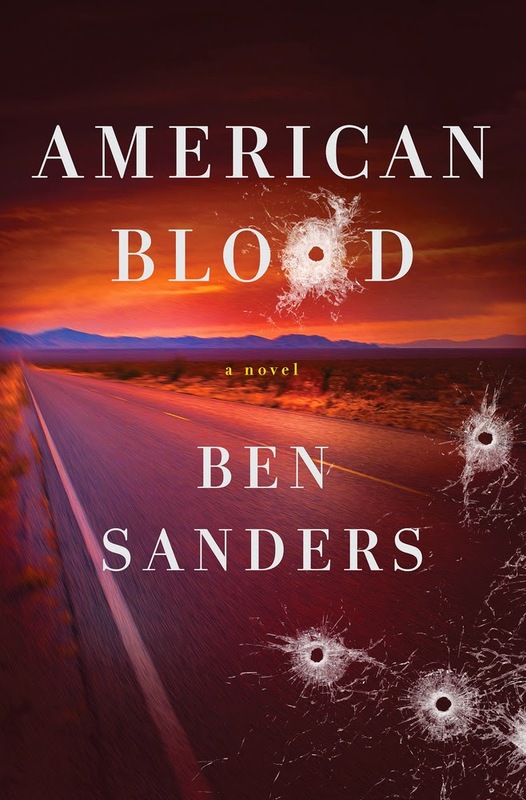 How do you feel about Sanders switching from New Zealand to New Mexico in his crime writing? Would you like to read this book?